Tank mounted ultrasonic transmitter unit compatible with the standard 32mm port fitted to modern plastic oil storage tanks.Plug in receiver unit with integral antenna.Premium quality LCD display readable from a wide range of angles under varying light conditions.One size fits all.Quick and easy to fit with no specialist tools or wiring required.On-screen low level warning alert with audible alarm reduces the risk of running out of oil.Ideal for monitoring heating oil and diesel.Up to 200 metres line of sight range via secure wireless FM data transmissions. 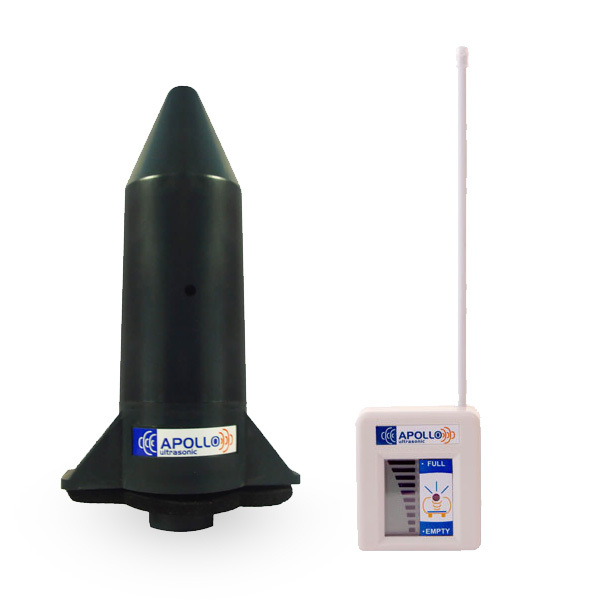 Apollo Ultrasonic is the original ultrasonic oil tank contents gauge and comprises a tank mounted transmitter unit and a plug in receiver unit. The transmitter monitors the level of fuel inside the tank and relays this data via a secure, wireless connection to the receiver unit, which cleverly and conveniently plugs into a standard electrical socket. The receiver unit displays the level of fuel inside the tank, via an easy to read LCD display, which usefully includes a low level warning alert. Apollo Ultrasonic is suitable for almost any tank up to 3 metres tall and is available with either a 3 pin UK/Ireland or 2 pin European electrical socket connection. Easy to fit, the Apollo Ultrasonic can be installed in minutes. Optional 48mm adaptor ensures compatibility with most steel tanks. Contactless technology and the absence of a direct connection to the oil supply line eliminates the risk of spills and leaks. Adds value to oil storage tanks and fuel storage installations.